Ear Irrigation – What It Is and How It Works? Ear irrigation is a very common and routine procedure to remove excess earwax build-ups and foreign objects from the ear canal. Earwax, also known as cerumen in medical terminology, is a waxy substance that the human ear produces to lubricate the skin inside the ear and protect the ear from water, bacterial infections, dirt and foreign bodies. Earwax is a self-cleaning agent and our bodies regulate the process without our interference. Cleaning the wax is unnecessary and even discouraged by medical professionals under normal circumstances, but some people secrete more earwax than others and it can potentially build up and block the ear canal, causing hearing difficulties, earaches and ringing in the ear. The ear canal and the eardrum are delicate instruments to catch and transfer soundwaves and earwax build-ups can negatively affect their function, resulting in discomfort and hearing loss. Ear irrigation is a safe and unobtrusive method to clean your ears and prevent such conditions. Occasionally foreign bodies, like dirt, sand or even small insects, can get lodged in your ears and it is important to remove such obstructions hastily, before they can cause any harm to those sensitive organs. Irrigation is usually the simplest way to get rid of such foreign objects. Ear irrigation can be performed at your doctor’s office or you could try it at home using an irrigation syringe or an irrigation kit that contains a spray bottle with a specially fitted nozzle – there are several irrigation products available at your local pharmacy or online. How to Perform Ear Irrigation? When you have ear problems and visit your doctor, they will first check your ear to diagnose the condition and correctly identify the root of the problem. Earwax build-up is not the only possibility and the problems might be caused by something more serious. Doctors use an instrument called otoscope to have a look inside your ear and ascertain the situation. Otoscopes are tools equipped with a light source and a magnifying lens inside a tip that is inserted into the ear and enables the person operating it to visually inspect your ear canal and your eardrum. 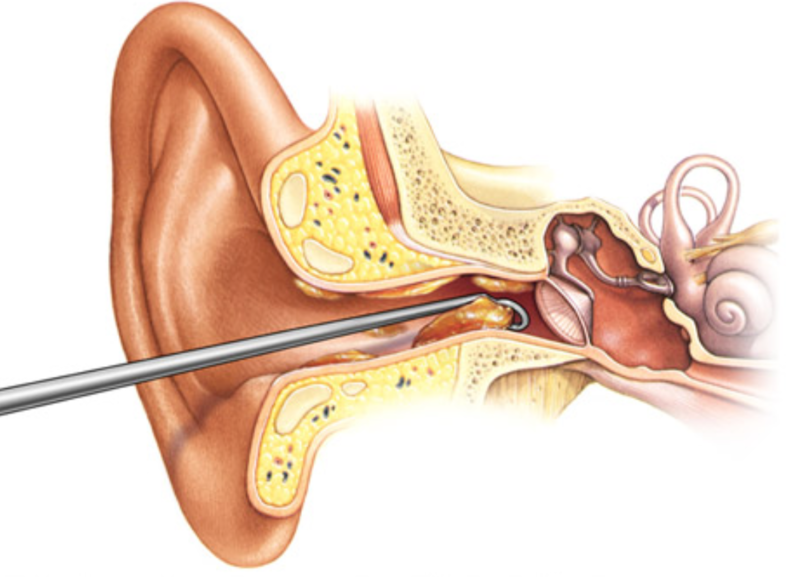 The physician will perform an ear irrigation if they identify an earwax blockage as the problem. They use syringes or bottles made specifically for the job. 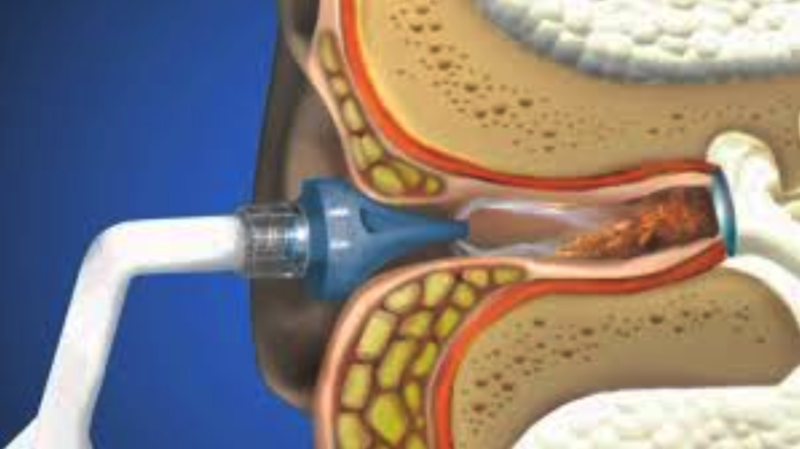 The tool in question is filled with water or a saline solution and a liquid stream is injected into your ear, using the fluid to soften and dislodge the built-up wax. The process can be equally successfully performed at home, you will just need to purchase the tools you need for the procedure. Syringes and other ear irrigation kits are readily available at your local pharmacy or at many online vendors at affordable prices, so that should not be a problem. Performing the irrigation at home affords you more comfort and time, so you can start off with eardrops designed to soften the earwax. Eardrops are easily available and are already included in some irrigation kits. Follow the instructions and administer the appropriate number of drops as often as stated – usually two to three times a day. While this step is not strictly necessary, the drops will soften the earwax and facilitate the irrigation process, making the wax easier to remove in later steps. Next, you proceed with the actual irrigation itself. You fill the tool you have purchased with water or saline solution, which is easily made by mixing a teaspoon of salt into water. Some irrigation kits also include special powder packs for the wash liquid preparation, making it more pH friendly for your ear canal. The water used should be warm, at least body temperature, because otherwise you could experience some unpleasant side effects like dizziness. After filling the container with liquid, you insert the nozzle of the instrument into your ear and start the wash. Whichever tool you are using, you can adjust the water pressure by how hard you squeeze the syringe plunger or the spray bottle handle. After a thorough wash, drain the liquid from your ear. Some kits include a small basin, which is handy to catch the drained fluid and prevents making a mess. Repeat the process as many times as necessary to completely remove excess earwax or any foreign bodies. After you have finished with the irrigation, simply wipe your ear with a soft cloth. As described, the irrigation procedure is really not complicated and anyone should be able to successfully perform it at home. There are, however, some potential risks and side effects involved, that every person using the irrigation should be acquainted with. Ear irrigation causes some possible side effects to manifest during or after the procedure. They are typically temporary and should fade away within a day, but they can feel uncomfortable. One of the most common side effects is the feeling of dizziness and vertigo. The eardrum is connected to the middle ear, which also functions as the center for balance control of the human body. As mentioned earlier, the water used in the wash should be at least body temperature, otherwise it could affect the middle ear and cause the unfortunate effect of feeling dizzy. If you experience such a problem, stop with the irrigation, wait for the feeling to pass and continue when you feel comfortable again. Other side effects of ear irrigation are feeling discomfort or pain and also ringing in the ears. Water pressure will create an unpleasant sensation, but if comes to the point of pain, stop the procedure and contact your doctor if the symptoms do not fade within a day. Experiencing pain could be the sign of other conditions, more severe than an earwax block. Under no circumstances should you perform an ear irrigation if the person in question has preexisting damage to the ear canal, eardrum perforations or tympanic tubes inserted in the eardrum. Also never perform an ear irrigation on a person with an ear infection. All of those conditions will not react positively to an irrigation and it will only make the matters worse. In cases like that and anytime you are unsure how to proceed, consult your general physician and they will advise you on appropriate actions. Of course, ear irrigation is not the only way to clean your ears and remove the stubborn earwax. People are different and what works for some, might not work for others. So, do your research and also consider the alternatives, which could be simpler, cheaper and may work just fine for you. Using salt water or natural oils like olive oil and mineral oil to soften and dislodge the earwax is probably the easiest method to try. Lie down on your side or just tilt you head ear upwards and place a couple of drops of the liquid into your ear. Stay still for three to five minutes and let the fluid work. After that, simply turn your head, drain the liquid from you ear and wipe it dry. Other alternatives include the same process but using a hydrogen peroxide solution or a mixture of medical alcohol and vinegar. Hydrogen peroxide is an earwax solvent and is a common ingredient in eardrops. Ear candling is also mentioned as an alternative method from the past, but it is discouraged nowadays, because it is not really effective and using a lit candle in proximity to the ear can lead to further complications and injuries.